Pamper sessions are a big boost to Christine who’s overcome cancer five times and is now battling leukaemia | News by Wales Express News, People Before Profit! A woman who has overcome breast cancer five times and is now battling leukaemia has spoken movingly about how a makeover service is making all the difference to her life. Widow Christine Sunter, 66, says the pamper sessions courtesy of the Boots No7 beauty consultants at Eagles Meadow Shopping Centre in Wrexham have given her a major boost in coping with her health problems. Christine was first diagnosed with breast cancer when she was 39 and it returned for a fifth time in January of this year – just months after she discovered she had incurable but manageable chronic myeloid leukaemia. According to Christine, she says she now feels so much better and more positive after being introduced to Ceri Evans from Boots at the Macmillan Information Centre at Wrexham Maelor Hospital. From left, Boots No7 consultant Ceri Evans, cancer patient Christine Sunter, P and am Wedley, senior Macmillan information and support manager and Boots No7 consultant Emma Jones. 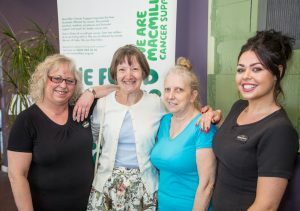 She said: “I was pretty down and miserable when I discovered the Macmillan Information Centre at the Maelor Hospital. I wandered in and had a chat with Pam Wedley the hospital’s Macmillan information and support manager. “She introduced me to Ceri and I felt so much better after a makeover. Ceri and her colleagues attend the Maelor Hospital once a month and are there to offer advice and help on skin, hair and nail care. “Cancer really affects your body in lots of ways and having that support and advice makes you feel so much better. It’s a great service. “I now pop into the Boots store in Eagles Meadow to see Ceri and her colleagues sometimes just for a chat and sometimes to pamper myself and have a makeover. “The breast cancer is what it is but the chronic myeloid leukaemia is not too pleasant. “I’m on a drug called Imatinib which has some horrible side effects. It’s a type of chemotherapy and makes you feel sick a lot of the time that’s why having a makeover and feeling better about yourself is so important. “I discovered I had the chronic myeloid leukaemia after going for a blood test. My white blood cell count was 90 when the normal range is somewhere between four and 11. The condition is incurable but it is manageable whilst the Imatinib does its job. She added: “I was really down and didn’t know who to talk to or where to go for help until I found the Macmillan Information Centre at the Maelor. Ceri Evans, who will be celebrating her 40th year with Boots in July, says training to be a Macmillan beauty advisor is something she is really proud of. She said: “We attend the Maelor Hospital once a month to give advice and help to women cancer patients on skin care, make up ideas and nails. “One of the usual side effects of chemotherapy is hair loss and we can help women understand how to apply their own eye lashes and eye brows. It’s all about making women feel better about themselves and more confident. Emma Jones, who also works as a Boot’s No7 beauty advisor, has just completed her Macmillan training. Pam Wedley, senior Macmillan information and support manager at the Wrexham Maelor Hospital, said: “I now support Christineeon a regular basis whether she needs emotional support or more practical advice. “I signposted her to the Boots No7 team and Ceri Evans as I felt it important she had a makeover so she could feel better about herself. She added: “Most people think of Macmillan as being only about end-of-life care, but it isn’t. We offer care and support in many ways before, during and after diagnosis. “The transformation in Christine is remarkable. She’s now an ambassador for Macmillan really. She’s raising awareness and has an remarkable and positive outlook on life. She’s always got a smile on her face and is now confident and just amazing.